and rest in the miracle of movement. 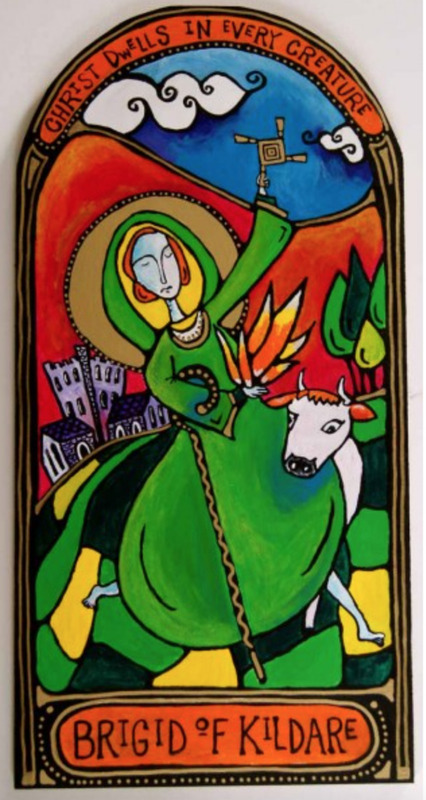 Today is the feast of Saint Brigid, an Irish leader and legend whom I have claimed as my own patron saint. She shares a name with the Gaelic mother goddess and a feast day with the Celtic festival of Imbolc, a day to celebrate spring’s first stirrings in the belly. She was said to be born in the threshold of a door and indeed has bridged the Celtic and Christian traditions. She was born on February 1 as both the daughter of a slave and a nobleman, and as she grew, she was known for her generous compassion for the poor. Once she was granted her freedom, she founded a double monastery at Kildare, where she began not only a farm and a convent, but also schools for metallurgy and script illumination. The story goes that when she asked for land to build her abbey, the King of Leinster grudgingly said she could have whatever land could be covered by her cloak. So she had her friends take a corner each of her cloak, and it miraculously expanded to cover the whole tract of land she desired, which included an oak grove and a holy well. This has led to the practice of laying out a piece of cloth on the eve of her feast day to receive blessing. Saint Brigid’s cross, which has been used as a symbol of protection in Ireland, was said to have been created when she calmly wove reeds at the bedside of a dying pagan king. When he asked what it was, she used the cross to convert him to belief in Christ. Echoing elements of the pagan legends, she is said to have lit a sacred fire at her monastery which was never to be put out. She is the patron saint of dairymaids and metallurgists, of midwives and scholars, of thresholds and of fire and of Ireland itself. I wrote these hymn lyrics last year during my celebration of the feast. a feast to call the spring. for stirrings change will bring. for light and warmth to grow. the thresholds of our days. to walk in Brigid’s ways. I’d been thinking about writing on my depression experience for a long time, but small voices that sit behind my ears would whisper, “People will just think you want attention,” or “Folks will think less of you,” or “You are making this all such a bigger deal than it is.” I am silencing those voices to make room for my own, a voice that is raw and unpolished and a little afraid. If we had a day for every time someone said 2016 has been a terrible year, we probably could make several new complete years. And in many ways, it has been a spectacularly awful year. The cultural atmosphere the U.S. election produced (or that produced the election) has been poisonous to breathe. We’ve felt helpless in the face of countless injustices: climate change, the war in Syria, systemic racism, etc. Illness has tried to pin down loved ones, and many of my friends have grappled with the death of someone close. I’ve cried about the future of the world during 2016 more than any other time I can remember. And yet. Without diminishing the devastation and fear and righteous indignation that we feel, I want to note that, for me, personally, 2016 has not been a spectacularly awful year. In fact, it has been a year of miraculous hope and healing. I’ve been struggling with depression since I was a teenager. It has come and gone over the years, swelling less like a tide and more like a tsunami, creeping up unexpectedly and then suddenly swamping everything, leaving me gasping for air and clutching for something to hold onto. The summer of 2015 saw my slow decent into the strongest depressive episode I have known. (I touched on my experience briefly in my yogurt post.) At first, I felt numbed to beauty – I couldn’t notice the flickering sunshine on waving leaves anymore. Then, I couldn’t get up the energy to clean, to cook, to eat. I desperately wanted company, but I didn’t have it in me to reach out and connect. Every morning and evening as I lay in bed, it felt like a great weight settled on my chest, a weight that pressed at every loss and pain I’d ever experienced and pushed at the cracks until rivers of tears broke through. I felt like I was viewing the world through a pane of glass, never able to participate, never able to shake the endless fatigue, never able to come fully alive. I saw little hope for the future—for my own life or for the planet as a whole. At the beginning of 2016, things had gone from bad to worse. Some nights I would be seized by an overwhelming terror. Lying on my bed and staring at the dark ceiling, I would stuff my hands into my mouth to keep from screaming, my body both shaken by silent tears and paralyzed by the gripping fear that, if I moved one inch, I would do something rash about the persistent thought that my life was just not worth living anymore. I felt like a deep pit was sucking the bones from my body, was draining me dry, was emptying me of everything good and beautiful. I wasn’t sure I had the energy to fight it. But I couldn’t find the words to say anything to those I loved; I didn’t know how to ask for help. I believed those little voices that told me if I spoke up I would be a problem, a burden, an annoyance, an attention-seeking fraud. My worth was tied to my productivity and to my outward positive attitude, and with everything inside myself crumbling down, I worked to keep those outer walls propped up as long as I could. When I began taking medication, it took off some of the edge, but it brought with it the side-effect of a crippling anxiety, a can’t-catch-my-breath worry that shellacked and veneered the deep existential fear already sitting in my middle. I kept trying everything I knew that was supposed to help. But still the foggy days wore on, and I thought this might be how I would live the rest of my life. I alternately railed at God for letting this disease take control of my life and begged God to release me from its hold. I’m not exactly sure what it was that brought about the change. Winter ended. That always helps, at least a little. I had my medication changed. I stopped eating sugar for a while. I finished my last full-time graduate school semester, and the unrelenting pace of the previous years slowed. I moved into the neighborhood where my faith community was. All the stars aligned, and the fear that life would always be a battle against the gravity of a black hole slowly receded. Hope grew like a dandelion in a sidewalk crack—not beautiful, not lush or fragrant, but miraculous all the same. In the past months, I have felt myself come back to life. I have laughed genuinely with friends. I have danced to music across my apartment for no other reason than I wanted to. I have reveled in the beauty of a distant mountain and of a tiny leaf. I’ve made yogurt and cookies. I’ve biked across the city breathing encouraging words to my working muscles. I’ve cried for a while and then felt a little better and lighter when I finished. I’ve made things with my hands and cooked real meals for my body. I’ve imagined a future for myself. Or futures. The paths are wide. I am ending 2016 miles away from where I began it. I am still afraid, but not of myself. I am still grieving losses, but not without experiences of small joys and celebrations. I am still worried about the future, both personal and global, but (most days) I feel empowered to participate in it and not just let it happen. I still get lonely and homesick and unsure, but I am learning to shatter the walls I’ve built around myself and to recognize that, at the very least, we can all be lonely and homesick and unsure together. I still get angry at God for things that have happened, but every time I yell and rail I am a little more assured that God is open enough to hold whatever I hand Her. So as 2016 looks to be ending with little hope, I offer this small, personal story of redemption. The change was not instantaneous. It wasn’t something I could entirely control. And it is not complete. Which is, perhaps, the biggest miracle: I am unfinished and growing. I end this year dynamically and vibrantly alive, even in my saddest moments, and where there is life, there is hope. My personal experience certainly doesn’t change the enormity of the challenges we face walking into 2017. But maybe my story can give you strength for the journey ahead—because we are alive. We are a whole garden of dandelions cracking the sidewalk, and we don’t enter this new year alone. Today at seminary we are doing service of sending for those going to North Dakota and prayer for justice for the situation there. I wrote this litany for our worship time together, drawing on Joel 2, Amos 5, and Isaiah 35. Blow the trumpet at Standing Rock! Sound the alarm on God’s holy prairie! Let justice roll down like waters! Let righteousness flow like an ever-living stream! God stands with those who protect the waterways. And a witness of truth. And a repentance that leads to abundant life for all your Creation. Set us on your Holy Way. And teach us to dream of your reign together. And all God’s people said: Amen. I didn’t have any scissors with me, so I pulled the sunflower blooms off the stems with my hands. This was a mistake. If I ever need to find a fibrous plant with which to braid a make-shift rope, I will probably use sunflower stems. ver, sewing new seeds of fear and frustration with every weed I pulled. But, even in the midst of my stewing, I couldn’t help loving and reveling in the light on the sunflowers and the tomato leaves and the cottonwood trees. I felt at home in the light there, even as I worried and fretted. Why is it that we love the evening light so much? I would just speak for myself, but it seems to be a universal human condition. My body was torn between the sinking feeling in my stomach and the euphoric feeling in my fingers as I plucked off ripe cherry tomatoes made brighter by the slant of the sun. The breeze lifted my hair as I pruned the dead branches. Turmoil and content wove together. A return to the sunflowers. I pulled and bent and twisted and tugged and even separated the fibers out so that I could work on one section at a time. It’s worth men tioning at this point that these were not sunflowers stolen from someone else’s garden plot; they were volunteer sunflowers growing out of the compost pile where I had dumped the fallen tomatoes and the shriveled leaves. That seemed entirely fair game to me. But these flowers didn’t want to be any kind of game. They wanted to go on existing in the compost pile, free of human hands and jars of water. And I felt just as determined to bring something of the garden’s peace back home with me. I managed to get some of the blooms: five sunflowers, wrestled from the woody stalks that towered above the rotting plant clippings. When I got home, I trimmed off the stringy remnants of our battle and put them in a water-filled mason jar. They sat on my wooden dining table, dropping bright saffron pollen onto its dark, shiny surface. I am grateful – they didn’t seem to regret their conquered position in my dining room. Is it always such an act of violence to bring a living blossom into one’s home? And was the violence against the flowers or against my own tumultuous insides? Or was it instead an act of being present, of saying: I know that not even these flowers will last forever, but I choose to put them in a place where I will be forced to watch them move through time, and I will learn to love each fading petal and each curling leaf; I will embrace the dance of life and decay, of happiness and discomfort, of beauty and frustration. It was not the flower I had to coax into my daily presence but my full attention. Somehow, my memory of being in the garden that evening is peaceful and not anxiety-ridden. Maybe it’s because the golden light surrounded everything and held it together. Maybe it’s because my situation was resolved soon after. Or maybe it’s because plants must, in some way, absorb all our tension and place it in the ground, buried with the fertilizer and the loam, ready to be composted into something more life-giving. Today is the feast day of the Holy Cross, and one of the scripture readings for the celebration is 1 Corinthians 1:18-25. While this passage relies on potentially problematic stereotypes about culture and ethnicity, it does remind us that all of us carry broken and misplaced expectations about what God’s redemption looks like. I wrote the prayer below as an invitation to open our awareness to God’s presence before meditating on the Corinthians passage. And I extend that invitation to you. and ease our desperation to prove our own power and wisdom. and teach us to listen for your voice in the lowly and forgotten places of the world. Open now our ears, minds, and hearts to the transforming work of your Spirit. They announced in the worship service that, in the evening, there would be a baptismal service for a member of the youth group. After the morning service had ended, there was the usual chatting and snacking and lingering, but this time a sizable group had congregated in the center of the worship space. A large circle of the floor had been lifted away, revealing a deep fiberglass basin. A gaggle of children of all ages surrounded one of the adult leaders, some standing around the basin, some gleefully running up and down the built-in steps and jumping in circles on the bottom. Their energy was riveting, and it didn’t stop when the basin began to fill with water. The children sat around the edge, legs dangling and swinging, watching the water swirl beneath them. Later that day, many of these children would be present to see a young man walk into the water and be dipped under. Maybe some of them would understand what was happening – maybe they wouldn’t. But whether they were present or not, knowledgeable of the sacrament or not, each of the children got to experience with their eyes and ears and feet and hands what the grace and excitement of baptism is like. They were able to practice it – to feel the contours of the space and join in the celebration with their bodies. I don’t know how many people were aware of the purpose of the tiny, wooden fonts at the side of a typical mainline chancel in the churches where I grew up. We didn’t reference them very often. As a child, I’d been witness to only a handful of baptisms; and there was no way for me to touch or taste or hear or smell the experience of the baptism. For something that was supposed to be a tangible sign of an intangible grace, the sacrament of baptism did not engage my body in the sacred. Children are not the only ones who need to touch and feel the truth of God’s grace. To be human is to have a body. When God sought to include us in God’s life, God didn’t require us to shed our bodies and become pure spirit. Instead, God took on a body, and it is saving miracle of the incarnation and the bodily resurrection that we affirm in baptism. All of us humans are in profound need of an experience of grace that goes beyond something simply intellectual that we observe. A purely “spiritual” experience that does not take into account our flesh and feeling is not spiritual at all, for it does not encompass the whole of who God made us to be nor the whole of the salvation story. I pray that we all have experiences in which we can respond to God’s gifts of grace and sacrament with all the abandon of an excited child playing in the baptismal font – that we may join God’s sacred dance in our bodies. The writing below is from a journal I kept while living in Ukraine about 5 years ago. I happened upon this entry the other day and had completely forgotten the insight it recorded. It is just a relevant to me today, in my current transitions, as it was for me then in that in-between space. I sat with my back against one wide doorpost and, knees bend, with my feet against the other. I thought about being here in Ukraine and not knowing where home is anymore and not knowing much of anything. I though about how my physical location aptly expressed my whole Being’s location – a threshold. I can’t remember when I haven’t felt like I was sitting in a doorway, in a threshold, in between, not an inhabitant of either side. I don’t remember how, exactly, but at that point, another thought came to me. In his parable of the Good Shepherd, Jesus says he is the way. The gate. The doorway. The threshold. I don’t even know exactly what that means for me, other than I have the opportunity to sit – or stand or wail or wait or breathe or exist – within Christ Himself. I hope to be learning to do that anyway, but I have found myself in the midst of what Jesus very clearly declared himself to be. I have a very clear memory of biking down Gaffield street last summer in the afternoon sun, breathing in the smell of linden flowers blooming on the trees that lined the streets. It didn’t matter how close you were to a linden tree – the scent permeated the air. I’d been looking forward to a repeat of last year’s linden event – my memory told me it happened sometime in early June – and I would eagerly sniff the air as I biked home from work at the library. It was both exciting and comforting to be in the same place for another summer, to watch the seasons change in a predictable way, to welcome the return of the flapping leaves on the cottonwood outside my bedroom, to see the light pour through my windows at summer solstice angles again. I enjoyed being able to notice and predict the way my surroundings grew and shifted with the lengthening light; in doing so, I felt pulled deeper and deeper into the rhythms that connect our lives to the life of the world … and to the life of the One who makes it. So much of my life has been spent moving from one place to another, and my longing to stay put in one place for a while is mostly rooted in this desire to enter the cyclical, predictable rhythm of things. So I waited for the linden flowers. I noticed the flower buds appear on the trees, but still, no unmistakable aroma. As I prepared for various weekends away at out-of-town weddings, I worried I would miss the peak. I returned from the festivities – still no pervasive linden scent. I began to wonder if I’d made some sort of mistake: I noticed a slew of fragrant, white-flowered shrubs in many of the places where last year I had supposed I was smelling linden, and I thought perhaps these shrubs were what I had been smelling the previous year. I suddenly felt like a stranger in my neighborhood. And then, one damp early morning, I walked to the library, and I suddenly felt surrounded by an indefinably sweet smell. I looked up. There, spreading in the branches above me, were dozens and dozens linden flowers, fuzzy and open-budded, quietly perfuming the air. And I was so happy. 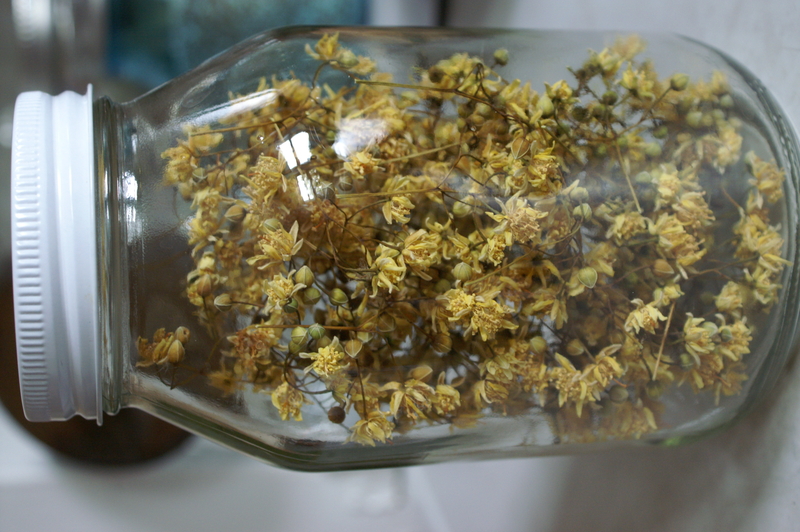 My dried linden flowers jarred and ready for tea. Later, the next day, as I cut off the fragrant blooms to dry for tea, I thought about rhythms and predictability and surprise. The websites I’d consulted to learn the best way to harvest the blossoms said that the linden tree bloomed in June and July, depending on weather. June and July – that’s two whole months of trees staggering their flowering, never going in the same order twice, never peaking on exactly the same day. Two whole months to bud and bloom and wither at whatever pace they like. Why would I ever have expected to enjoy the flowers at precisely the same time every year? My desire to be rooted somewhere is good and beautiful and worth paying attention to, but seasons are never entirely predictable, even in one place. As Aslan tells Lucy in Prince Caspian, “Things never happen the same way twice.” Much of the beauty of the world – and its pain, it’s true – is held in the moments that surprise us, that take our breath away, that command our full attention. If I lived near Gaffield Street for the rest of my life, I would likely enjoy the smell of the linden blossoms every summer. But I think I would lose something precious the day they no longer had the capacity to surprise me. Rhythmic does not mean predictable, and “rooted” is not equivalent to “same” – after all, those linden trees have deep roots, and they’re changing all the time, every season, every year. So it was my memory, and not the trees, that had shifted the dates of the peak. I don’t think this invalidates anything above. If our memories shift and twist, then everything I pondered about change and rootedness becomes even more necessary to internalize. For even the selves with which we experience the world are never the same, both rooted and growing, both predictable and wildly mysterious. I preached this sermon at 6:45am this Easter morning, standing on the Clark Street Beach of Evanston, with the sun rising over Lake Michigan. We then shared in the sacrament of communion as we celebrated Jesus’ rising. Jesus Christ is Risen! He is risen indeed! Alleluia! The lectionary text was John 20:1-18. I spent the week before Palm Sunday in Turkey with a group of Northwestern students, visiting prominent historical and religious sites and engaging in interfaith dialogue. As we entered into the mosques and holy sites of Islam, I was captivated by the way the Muslim worshipers prayed in these spaces. The men performed their ritual ablution outside under awnings of stone and wood. They sat on stools with their pant legs and shirtsleeves rolled up, water pouring out of the spigots and into their hands. The women’s area was enclosed, with talking and splashing water echoing around the room. Headscarves came off and towels came out. In both places, the worshipers brought soap—this was no ceremonial splashing but real washing, up to their knees and elbows, behind their necks and ears. In the prayers themselves, the worshipers raised their hands, bowed to the ground, and came up again in a dance of devotion. The chanted call to prayer was loud and throaty and passionate. Theirs was not a religion that stayed only in their heads or existed primarily in some detached spiritual realm. Prayer was a place where their bodies and spirits were one, where the God they worshiped was intimately invested in their embodiment. Sometimes we forget or gloss over the physical fleshiness of our own beings, let alone the physical fleshiness of Jesus. We forget that the God we worship had dirty feet that needed to be washed, cried tears that ran down his chin, got hungry and tired. Our God had a body that bruised, and bled, and died, a body that needed spices and aloes to keep the smell of death away. When we forget that our God had a body, we run the risk of turning the resurrection of Jesus into a nice, clean metaphor about the cycle of new life rather than a tangible experience of God’s power for real life over real death. The Gospel of John confronts this kind of thinking. The passage we read begins the resurrection account with Peter and the beloved disciple discovering the empty tomb and folded grave clothes. But it doesn’t end there. God doesn’t leave us to go home wondering about the lack of a body. Easter is not just about an empty tomb but a risen Christ, about a God who is present in the real earthiness of our existence. After Peter and other disciple head back home, Mary remains outside the tomb, not just crying but weeping with streams of tears. She, like the disciples, is confused, so confused and distraught that when Jesus himself stands in front of her, she doesn’t recognize him. For millennia Christians have speculated why Jesus was unrecognizable in this moment, but I think that the answer is very simple. Mary wasn’t looking for him. She and the disciples had encountered an empty tomb and were stuck in that emptiness. We have been there, in that space. We have all stared into the face of death—into loss, into pain, into uncertainty, into utter abandonment—and felt the great gravity of emptiness pull us into hopelessness. I stood in that space a few months ago when I found out that a young friend and member of my home church had attempted suicide and was in a coma on breathing tubes, hanging between life and death. The day they were deciding whether or not to turn of the machines connecting her to life-giving breath, I stood in the shower and wept. The emotions would hit me in waves: one moment I’d be putting shampoo in my hair and the next I would be about to collapse, pleading with God. I couldn’t keep the prayers inside of me—they burst out audibly. At one point, I did fall to my knees, and kneeling in a shower feels somehow a little like drowning. Drowning in the awful reality of unstoppable death. This is why we need a God with a body. When I knelt in that shower and cried and performed my own ritual ablution, I needed God to be present with me in that messy, terrifying moment of emptiness. A God of some non-material, non-embodied reality would not be able to enter into my experience of despair and sit with me under the pounding water and fearful tears. This is the good news: God in Jesus Christ saves our whole selves through his embodied death and resurrection. Jesus is present with us not as an ephemeral spirit but as a God who chose to take on flesh, to take on material molecules and a thirsty throat and hands that could touch and hold. At the beginning of Lent, we smeared ashes on our foreheads and declared, “From dust you came and to dust you will return.” Our God became this dust that makes us up. There is something so good, so necessary, about our bodies that Jesus lived and died as a body so that, when he rose in the unexplainable power of God’s life over death, our bodies would be a part of that victory. Our emptiness would be transformed into abundant life. When Mary, blinded by her tears and her grief, confronted who she believed was the gardener, he asked her a simple question: “Whom are you looking for?” Whom are you looking for? What kind of savior are you looking for? Are we looking for a God who floats above our material reality and rescues us from our bodies? Or do we bring our whole bodies to the worship of God and expect God to be present in our embodied reality? Even when we are blind to the abundant life God offers, Jesus, as he did that first Easter morning, calls our names. Jesus speaks, and his voice echoes in our eardrums and pumps through our blood and calls us to the recognition of his presence in the very stuff of this here and now life. We turn around and see Jesus standing right in front of us, where we least expect it, in the mundane, every day, physical reality of our lives. In the sand between our toes, in the laughter of a loved one, in bread and wine and water, in grace that floods every moment. We touch and hear and see and taste that the Lord is good. My friend from church who attempted suicide did not die that day. She miraculously not only lived but suffered just minor brain damage and memory loss. But I know that someday, like every one of us on this planet, she will die. She will be lowered into the ground and covered with the dirt from which she came and to which she will return. Just like each of us standing here on this beach. But because of the risen Jesus, we know that this is not the end of the story. Through the risen and transformed body of Jesus Christ, God holds our bodies and lives—hers and mine and yours—and, though we don’t yet know how, God will bring us all into completion and fullness. The resurrection of our embodied God will extend to us all. So as we enter this season of Easter, we are called to pay attention to where the risen Christ shows up in our embodied reality, often where we least expect it. When we turn to Jesus and listen to his voice, we are invited into the miracle of God’s uncontainable, close-as-breathing presence, and we will be able to say, with Mary, I have seen the Lord.